It’s raining in the zoo and Frankie the flamingo thinks she is sinking! So she sets off on a mission to find out why. 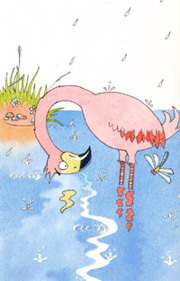 Using the story of an inquisitive flamingo, a determined dragonfly and a crab who doesn’t like poo on his head, pupils discover why it is important to save water and the best way to do so. This story is an uncomplicated, entertaining and educational way to engage Key Stage 1 pupils on the topic of saving water. All pupils get a badge and a Frankie postcard to colour in. Each class will receive five copies of the book ‘The mysterious case of the sinking flamingo’.